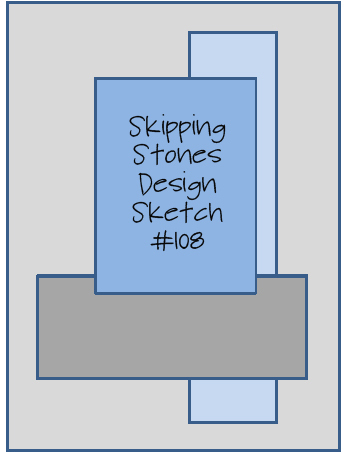 I made this card for the current Skipping Stones Sketch Challenge #108. I haven't had time to enter this challenge in a long time, but I love using my Skipping Stones Stamps. This is one of my favorite stamp sets and I feel like the sentiment describes me perfectly lately - I've been doing lots of shopping and I really prefer it to going to work!! But, if I want to buy new stamps I'll have to go back next week. Thanks for stopping by! I haven't inked up that particular stamp yet and your card here makes me really really want too! What a fabulous and absolutely fun design! 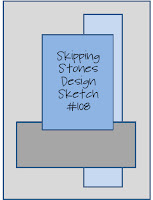 So glad that you inspiration with the sketch and found some time to play at Skipping Stones Design! Such a fabulous sentiment! And a wonderful funky design which works perfectly with it! I am with you... work does get in the way.. but I need to pay if I want to keep playing! This is super fun! I love the way you colored the image! Thanks for playing along with us over at Skipping Stones Design! Oh, if only we could shop for ourselves for a living! That'd be so fun. :) Cute card, Donna! So cute! Thanks for playing along with us this week at SSD! Oh, how fun!!! Love the colors and that stamp set! I've used the set before, just not that particular stamp. Thanks for joining us over at SSD this week! Fun, fun card! Also have to tell you I have a Welsh Pembroke Corgi who is a cutie-patootie, too! Aren't they fun! ?